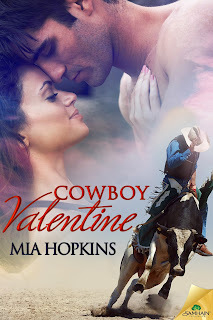 Mia Hopkins: COWBOY VALENTINE Blog Tour! I can't believe my debut book Cowboy Valentine will be released on Aug. 25 with Samhain Publishing. It's available for purchase at all these fine places. To celebrate and spread the word, I'll be visiting the following blogs with excerpts, playlists, character reveals, and other fun stuff. Come say hi, leave comments and enter for a chance to win a FREE download of Cowboy Valentine and a FREE print copy of Cowboy Heat. a free download of Cowboy Valentine and a free print copy of Cowboy Heat!